Please remember before giving your unwanted bicycle to a door to door scrap collector that by donating it to us you are helping another unemployed local person back into employment. 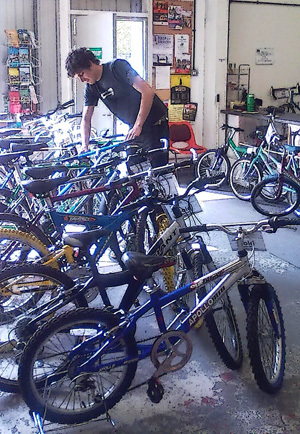 All of the bikes we refurbish or break for spare parts have been donated to us, so we depend entirely on the kindness of our local community to keep us supplied with bikes. So thank you, Stafford - and keep 'em coming! We never say no to any bike regardless of condition so please bear us in mind when you are spring-cleaning your garages and sheds. That cobwebbed old Raleigh of yours could have new life breathed back into it by us and make an affordable bike for one of a new generation of cyclists. As a Charity we cannot afford a dedicated vehicle to use to collect your donations, but we do hire-in a van as and when needed. However to make this economical to us we only do this every few weeks, so if you want your unwanted bicycle collected there may be a slight wait! We also want your unwanted bicycle parts as these can be used to help us refurbish other bikes. So whether you have just one pedal or a shed full of old unwanted bits please think of us before they are thrown in the skip! Call 01785 25748 if you would like us to collect your unwanted bicycle or drop it off at our Unit on Greyfrairs.